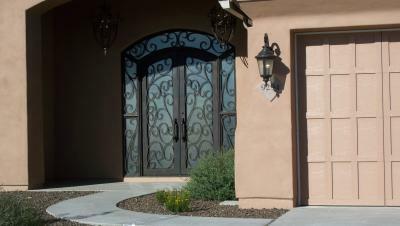 Breathtaking entry doors are what Signature Iron Doors is known for. The transformation that is seen above for a home in Paradise Valley is one that every client can be assured of when they choose Signature Iron Doors. Whether you want a custom build or one of our popular designs for your remodel, your door will be hand forged and guaranteed to fortify and enrich your home. Located in Phoenix Arizona, we have technicians and designers who are always ready to serve homeowners anywhere in the valley. Call us and come visit our show room to discuss with a sales representative and see why Signature Iron Doors is the leading a Iron Door manufacturer in Paradise Valley Arizona 85253 and the Phoenix Valley.